Chile defeated Argentina on penalties to end their 99-year wait for a Copa America crown and condemn Lionel Messi's side to a second straight heartbreak in a major international final and see the hosts book a spot in the 2017 FIFA Confederations Cup. Arsenal star Alexis Sanchez struck the winning spot-kick for Chile, as the hosts clinched a 4-1 shoot-out victory when the game ended goalless after extra time. Sanchez chipped the decisive penalty down the middle past Sergio Romero to spark wild celebrations in front of a 45,000 capacity crowd at the Estadio Nacional in Santiago. Chile took control of the shoot-out when Gonzalo Higuain blazed his penalty over the bar before Chile goalkeeper Claudio Bravo saved Ever Banega's spot-kick. Argentina captain Messi, aiming to inspire the South American giants to a first international title in 22 years, could only look on distraught as Chile celebrated. 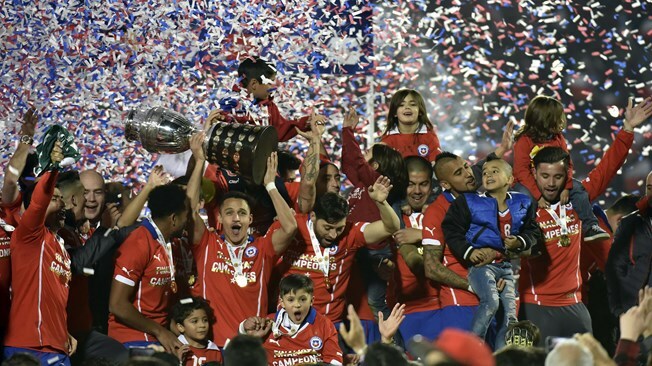 Chile's win was their first ever victory over Argentina in the Copa America. "It is a dream come true. We have worked so hard for this," said Chile star Arturo Vidal. The midfielder said Chile had been determined to win the Copa America after exiting the FIFA World Cup™ last year on penalties. "We talked about it in Brazil that we were going to win the Copa America," Sanchez said. "This is really a great generation we deserve this." But it was another crushing loss for Messi and Co., almost a year after Argentina lost the World Cup final to Germany in Brazil. The game went to penalties after a hard-fought 120 minutes ended in stalemate, with neither side managing to unlock their opposite defence. Chile started at a ferocious pace before Argentina gradually managed to gain a foothold in the game. Messi, invariably tracked by two or three red jerseys throughout, almost played Sergio Aguero in with a superb pass after six minutes only for Chile to clear. At the other end Chile came closest to opening the scoring early on when Vidal volleyed a deflected Sanchez cross goalwards, with Romero diving to save. The desperation of both sides often threatened to cross the line, with some full-blooded tackles drawing the ire of Colombian referee Wilmar Roldan. Chile midfielder Charles Aranguiz was lucky to escape a caution for a cynical hack on Angel Di Maria who later limped out of the contest on 29 minutes to be replaced by Ezequiel Lavezzi. While Chile pressed forward relentlessly and launched a series of forays into Argentinian territory, it was the tournament favourites who had the better chances in the first half. Argentina almost grabbed an opener in the 20th minute when Sergio Aguero met a Messi free-kick with a close range header that Bravo parried away. On the stroke of half-time Argentina probed again and Javier Pastore set up Lavezzi whose shot was blocked by Bravo. The second half followed a similar pattern, with clear-cut chances thin on the ground as defences remained on top. Sanchez went close for Chile on 82 minutes but hooked his volley just wide of the post. Argentina almost snatched a dramatic victory in the dying seconds with a well-worked move that began after Messi skipped clear of the Chile defence and released Lavezzi on the left flank. Lavezzi found Higuain - on for Aguero - at the far post but the Napoli striker couldn't finish from a tight angle and shot into the side netting as Chile escaped. In extra-time Sanchez almost punished a rare slip by Javier Mascherano but shot over the bar. Then it was to be Chile's night, to the delight of the home crowd, in the shootout.